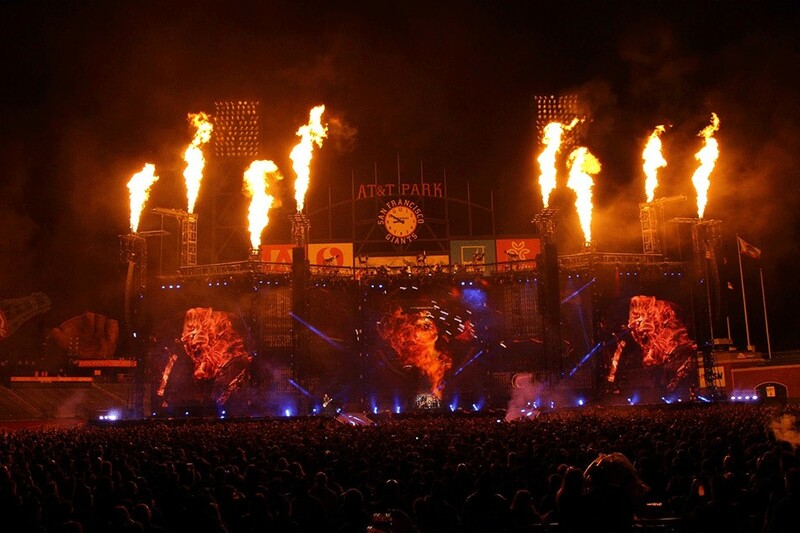 Martin by HARMAN’s new Atomic™ 3000 LED fixtures are helping illuminate the power and passion Metallica’s audiences expect. For more than 30 years, the legendary heavy metal group has been wowing global audiences with their aggressive, fast-tempo music, virtuoso-level musicianship, imaginative album concepts and memorable live show experiences. Inducted into the Rock and Roll Hall of Fame in 2009, Metallica’s creativity and influence continue to evolve and drive the thrash metal genre. Koenig explained that while he likes to use as much new technology in his designs as possible, he has to be careful when using new technology with such a legendary act. He needs to make sure the light looks appropriate for the band. The Atomic 3000 LED from Martin is the ideal blend of a traditional strobe and cutting-edge LED technology. Capitalizing on the original Atomic 3000 DMX’s 15 years of success, this new version features identical functionality and behavior—with the added benefits of LED technology. It offers the same extreme brightness as its iconic predecessor, but with substantially lower peak power consumption. The Atomic 3000 LED is not just a strobe, but also a creative tool that incorporates backlight illumination with RGB-controlled LEDs pointing into the reflector. It delivers stunning eye-candy looks similar to the MAC Aura and the MAC Quantum Wash. Internal FX macros and simplified reuse of the original Atomic Colors scroller complete the full-feature package and empower the Atomic 3000 LED to become the ultimate creative lighting tool. Rob Koenig, owner of Ignition Show Design (http://www.ignitionshowdesign.com) is a lighting designer, director and programmer with more than 20 years experience in the industry. His credits include work for Matchbox 20, Deep Purple, Better Than Ezra, Lit, Ministry, Live and Billy Idol, to name a few. Recently, he has been working with Butch Allen as a programmer/LD with Eric Church and as a programmer on Carrie Underwood, New Kids on the Block and The Black Keys. Koenig is also an LD and programmer for Phil Ealy on the Guns N’ Roses reunion tour.